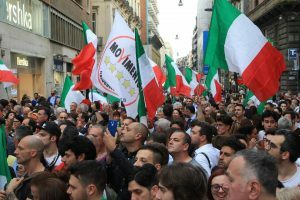 Italy Just Took A Step Closer To Mass Blockchain Adoption | News by Wales Express News, People Before Profit! After months of uncertainty Italy has agreed a coalition government — sending a sigh of relief across global markets and pushing Italian bond prices sharply higher after an earlier rout. The new government may do more than settle markets, however, with plans to push blockchain technology — which underpins the volatile and disruptive digital currency Bitcoin — into mainstream use. The prime minister-designate of Italy, Giuseppe Conte, has nominated ministers from both the right-wing Northern League and the 5-Star Movement (M5S) — with the anti-establishment M5S previously espousing the potential benefits of the blockchain and expressing hope it could reinvigorate trust in Italy’s corrupt public sector. M5S wants to grow blockchain technology beyond its traditional world of finance to help streamline public services. A Blockchain is a decentralized ledger, first used to power digital currencies but now being trialled in everything from supply chains, personal identification, and auditing. Many expect use of blockchain technology to grow as more uses are discovered (though there are also warnings of blockchain-mania, with it being used unnecessarily). Italy, which has struggled with stability since World War Two, ratcheting through 64 governments, is currently grappling with an economy in ruins. Managing Italy’s debt — a record 132% of gross domestic product and the highest in the euro zone after Greece’s — along with issues of immigration and the country’s membership of the euro, will be one of the new coalition government’s biggest challenges.